In the next two or three blog posts, I’m returning to a familiar theme—visiting donors, cultivating relationships, and securing donations. Building long-term donor relations is an acquired skill that should be exercised and perfected over time. You can’t just wander in and expect to be successful because you “really, really love people.” Nor can you build a successful career by simply working hard. If it were as simple as that, a lot more fundraisers would be a lot more successful. The truth is, there are communications, management, and organizational skills at every level that are just down right essential. 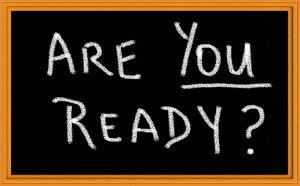 In the next few posts I want to remind fundraisers about some things they probably already know—the importance of preparation, focused presentation, precision Q&A, attentive listening, personal likeability, visit evaluations, etc. It doesn’t matter if your upcoming meeting is with an old friend, a long-time board member, or a potential donor, you can’t just rely on your sparkling personality. You have to become a person with the habit of preparation. Three preparedness examples come to mind. One is a recent example I haven’t thought about until this article, the other two are meetings that I will never forget. Several years ago a financial services firm contacted my office requesting a 2,000-3,000-word article for a fundraising publication. I write a little blog every month but certainly don’t think of myself as an established author, let alone a professional journalist. Nonetheless, I was solicited for an article. Several thoughts about the firm’s solicitation. that was due in a few weeks. Of course, I think of every solicitation in terms of fundraising requests and in this case all the ways the firm was unprepared to make the ask. Apparently, they were unfamiliar with what I had previously written, my travel schedule, the appropriate contact person in our office, or (most importantly) the people who might influence me to respond to on short notice—all of which would have been relatively easy to discover. I never responded because the request never found its way to me. In a post a few years ago, I described a visit with a potential donor who lived in one of the “old-money” neighborhoods of Nashville. She was probably in her mid- to late-70’s, and I quickly got the impression that she and her late husband had done very well financially. I was clearly out of my depth, still learning how to talk “high-affluence”. However, the more significant problem was that I hadn’t done my homework. Having no idea what to ask, I just took a shot in the dark. My question was answered pretty quickly as I began to realize that there was indeed a lot to lose. Having presented my appeal for a large gift, the elderly lady’s countenance immediately fell. I think her jaw literally dropped open. It was as if I had reached across the table and slapped her in the face. I was clearly out of my depth, still learning how to talk “high-affluence”. However, the more significant problem was that I hadn’t done my homework. Decades have past, but I can still remember that visit like it was yesterday. It was pretty embarrassing, and I was actually ashamed of my presumption and unpreparedness. No matter how hard I tried to backpedal from the request, it was no use. In following years, I would call and leave messages about an annual gift—calls she never returned. There can be a weird and creepy side to over-preparedness, which was demonstrated several years ago by a visit from two representatives of a local nonprofit. I had never heard of their organization, but that’s not unusual. What was unusual was their approach. Apparently, their organization had done some research and had targeted me as a potential donor. Not too far into the meeting they shared their findings and announced that they had decided that I should make a large donation to their organization. Perhaps their presentation wasn’t that crass, but that’s the impression I got and that’s precisely how I remember it. I was simply astonished at their presumption. As the conversation continued, I became increasingly irritated. I’ve never thrown anyone out of my office, but we were definitely closing in on that event. They had done a little preparation. But they knew nothing about me, my giving habits, or my giving interests. They just discovered that I had a little money and felt I should give them some of it. Here’s the takeaway from all three solicitations. When you go to a meeting or make a proposal to a successful individual that betrays your lack of knowledge about him/her, it has a kind of dishonoring effect. If you don’t have the preparation habit, you’ll eventually embarrass yourself or possibly offend current or potential donors. And it may happen more than you realize. Some donors are more easily offended than others. However, most of them are very gracious and would never make critical comments about how your presentation made them feel. But that doesn’t mean they don’t feel it or take it personally. I’ve prepared for more donor meetings than I could ever begin to count… but have never once regretted being over prepared. You’ll never be sorry for making the habit of diligent preparation a foundation of your professional life.